Measuring performance within a single game is a tricky thing: it’s why we insist on large samples of games before we make judgements on whether a performance is repeatable. Unfortunately, there is no single stat that takes into account all the various metrics that we value that occur in a single game. That is, there wasn’t until Dom Luszcsyszyn unveiled his Game Score statistic on Hockey Graphs a few weeks ago. Game Score uses a variety of metrics that we know and love, including both standard and fancy stats, and rolls them into one, simple number. I was so enthralled by this that I was determined to apply his formula to the Canucks’ 2015-16 season and see who had the best individual games, and who had consistently good ones. Dom admits in the article that there are several weaknesses to the method. Its simplicity, while being a weakness in some ways (Game Score is devoid of context and the weighting system is largely subjective), but it is also a strength. This is a simple, easy to interpret number that seems to do a fairly strong job of determining a player’s performance in a single game on a relativistic scale. Most of this data is readily available in standard box scores, and that which isn’t is easily found on the internet. To gather the data for the entirety of the 2015-16 season, I (like Dom) used the custom query function on Corsica. Here is what I found. To the surprise of nobody, the Sedins each make appearances in the top ten games of the 2015-16 season. The November 21st game against Chicago comes up a couple of times. That was there game where 35-year old Henrik Sedin set a new career record with five points in one game, including a goal and four primary assists. Daniel was the recipient of three of those assists, netting the infamous hat-less hat-trick. That game ranks first (Henrik) and fourth (Daniel) on the top ten list. Daniel appears again on the list in the eighth spot for his three point game on opening night against the Flames, in which he also had seven shots on net. A couple of other hat-tricks appear on the list, as Radim Vrbata’s hat-trick against Buffalo (along with six shots on net and a positive Corsi rating) ranks sixth on the list, and Jannik Hansen’s hat-trick against the Pittsburgh Penguins in January ranks ninth. Hansen also appears in the seventh spot on the list for his four-point game against Columbus in November – the game in which he was first put with the Sedins. We also see the start of what will become a pattern here: the Canucks’ goaltenders played a lot of very strong games last season. As anyone who watched the games will remember, there were games where goaltending was the only thing keeping the Canucks alive. Games on this list includes 47+ save efforts: a 47-save game by Jacob Markstrom in March, a 2-0 loss to the Winnipeg Jets (including an empty goal against) ranks second on the list; a 47-save game by Ryan Miller against the New York Islanders which the Canucks won 2-1 in a shootout ranks third; and a 48-save effort by Ryan Miller against the St. Louis Blues (a 3-0 loss with an empty netter) ranks fifth. Moving on to the worst individual games of 2015-16, we again see that a few players make multiple appearances. Matt “81 games” Bartkowski appears three separate times in the worst ten list. Getting massively out-possessed are key components of getting this far down the list, and that was one thing that Bartkowski was particularly adept at. A minus-3 goal differential during a January game against the Capitals amounted to his worst effort, which was sixth on this list. Another game in which he put the team shorthanded a couple of times ranked ninth. The Big Russian appears twice here as well, which is unfortunate but not entirely surprising for a fresh face. One such game occurred in late March, as part of the Canucks’ nine game losing streak we all remember so fondly – he had a minus-3 goal differential in that game. His other appearance was the third rank game on this worst ten list, in which he had a Corsi differential of minus-21, one of the worst differential any player had all season. Negative goal and penalty differentials certainly didn’t help either. The dearly departed Jared McCann appears on this list twice, at second and fourth worst. In both cases, the statistics were similar: terrible possession numbers, minus-2 goal differentials and awful faceoff percentages (a Jared McCann staple in his rookie year). The December 25th game gets a slight edge as the worst of the two, owing to a double minor that he took. Among the cameos on the list are Emerson Etem and Sven Baertschi, players who were otherwise decent by this metric who had very bad nights – again trademarked by getting buried in shot attempts, with negative goal differentials sprinkled in as well. The winner of worst game of the season belongs to the culture carrier himself, Derek Dorsett. In a 5-0 loss to the L.A. Kings on December 28th, Dorsett boasted a minus-18 shot attempt differential, a minus-3 goal differential, and also put the team shorthanded. It was a bad night for him in particular, but also him linemates, which included Jared McCann’s fourth spot on this list, as well as Chris Higgins, whose night just missed this list as the twelfth worst game of the season. 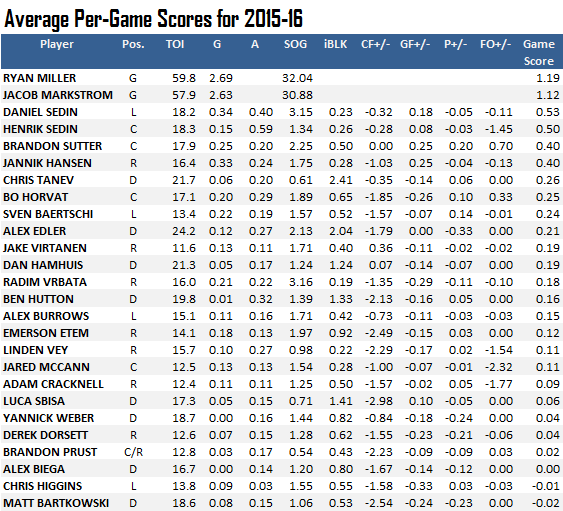 As with what we’ve seen already, the Sedins and the goaltenders sit at the top of the list. Cumulative scores obviously don’t take into account per game rates, so goalies, who aren’t expected to play every game, slide down the list a bit, as do players that miss large chunks of time with injuries. The Sedins made it to the top largely because of their point totals. Daniel, who played more games and got more points than Henrik, has a boost there. Daniel also took far more shots and had a better goal differential. Both goaltenders find themselves in the top four. Despite near identical goals against average and save percentage numbers, Ryan Miller comes out way ahead, having played more games and more minutes. After the twins and goalies, the remainder of the usual top six rounded out spots five through eight. Jannik Hansen’s impressive point totals and team leading goal differential afforded him the fifth spot, while the makeshift second line held the next three places. Vrbata’s shot totals gave him a boost, while Horvat and Baertschi both had impressive penalty differentials. Rounding out the top ten were Alex Burrows, who was really just the least bad of the bottom six, and Chris Tanev, who basically blocked his way into tenth spot. Here’s a full rundown of the per-game averages of each player that logged at least 300 minutes. The most surprising addition might be the much maligned Brandon Sutter, who only played in 20 games last season, but performed well by most metrics, including this one. While Sutter was around, the Canucks were still playing good hockey, and his numbers reflect that. He broke even in Corsi differential and was positive in goal, penalty, and faceoff differential. Both his penalty and faceoff per-game differentials were the best on the team. The next several slots shake out roughly similar to the cumulative rankings, although Vrbata takes a bit of a plunge, with Baertschi, Edler, Virtanen and Hamhuis all passing him – all players that missed sizable chunks of the season. Virtanen and Hamhuis were the only players on the team that finished in the black for Corsi differential. There are a number of fringe players as you make your way towards the bottom, like Etem, Vey, Cracknell, Sbisa, Weber, Prust, Biega, and Higgins. Yet each and every one of these players performed better on average than Matt Bartkowski, he of 81 games last season. It isn’t easier to get a negative number in the Game Score statistic – most players only have a handful of those games per year – yet Bartkowski averaged a negative game score. Only Luca Sbisa had a worse per-game Corsi differential, and only Alex Edler and Yannick Weber had a worse per-game penalty differentials. Bartkowski also blocked fewer shots per game than any other defenceman, and his production is pretty lackluster. Yet somehow he is without a contract for next season. Game Score is still in its infancy, and Dom has listed a myriad of weaknesses, though given the fact that it’s the middle of the summer, we can probably expect that some tweaks will be made either by Dom or by others by the time the 2016-17 season rolls around. In any case, it’s an interesting method of assessing players on the basis of an individual game. Yes, yes, Bartkowski won’t be back. a fringe dman that shouldn’t have gotten that much opportunity to screw up. makes you wonder if he would have seen that much ice time if it wasn’t for all the injuries? I was just looking at Dom’s predictions for each team’s top 3 players next year. His metric is cool, but it tends to favour high incident players who shoot a lot. And ignore other contributions. Leading to some interesting rankings on some teams, as to who their “best players” are. As with all fancy-stat systems, take it with a grain of salt. BTW, he predicts Daniel, Loui, Henrik as the top 3 Canucks for 2016-17, to nobody’s surprise. Would that be the game Tryamkin was on the ice for the whole two minutes successfully killing a penalty leading the commentator to use the wow factor? It never ceases to amaze me how “fancy stats” go through so many machinations to tell us what we already know by, you know, watching a game. During the end of last season I made a point of watching Tryamkin a lot, and I remember that game -3 and also recall him not being the guy on his line out of position for those goals. Its not fancy, but I saw it. Average Per Game Scores – With the exception of Biega, Sbisa, and Doresett everyone south of Etem on that list is gone. The Canucks will be a better team (even marginally) for it. I’m all in favor of cutting dead weight. Please forward to Coach “Put in Dorsett we’re down a goal” Desjardins. As for Groot — gets off the plane speaking no English, to join a team decimated by injuries and being QB’d by a rookie Hutton, for the final 20 games of the season and he still plays better than Bartowski, and you have him on the list. Analytics — should come with a helmet and a bottle of aspirin. Interesting stat. It lines up pretty well with my eye test over the season. These numbers also confirm why Vey, McCann, Cracknell, Weber, Priust, Higgins and Bartkowski won’t be back, that the Sbisa and Dorsett contracts were simply bad and that we may end up missing Dan Hamhuis a lot more than we expect. It also suggests that if we are playing Biega, and Sbisa next season, things will be tough. I’m not surprised at all that Sutter ranked so highly. The team was much, much better with him in the line-up, which bodes well for this club going forward. Foundational indeed. So what were Gudbranson’s and Eriksson’s numbers?